Missing teeth can be unappealing and can lead to other dental issues such as unwanted shifting of teeth. Sometimes, the best option to replace missing teeth is through dental bridges. In simple terms, dental fixed bridges are one or more crowns (see Crowns) that are permanently and strongly connected together to replace a missing tooth. Often, it involves three or more units, and the pontic (usually a middle unit) replaces the missing tooth. A dental bridge rely on the adjacent teeth to support the pontic. Because a dental bridge is essentially crowns connected together, it has very similar characteristics to crowns. They are aesthetic, strong, and predictable. Dental bridge is a quick way to replace a missing tooth. It usually requires only 2 visits, 2 weeks apart for the lab to fabricate the bridge. A longer bridge may need 3 visits to ensure the fitting of the supporting structure before the porcelain is added. What are the disadvantages of bridges? One disadvantage of a bridge is the requirement to reshape the adjacent teeth to make room for the bridge material. This is most undesirable when the adjacent teeth has no decay or large restorations to begin with. A special type of bridge called Maryland bridge can be used to minimize the reshaping of the adjacent teeth but it is less sturdy due to its sole reliant on bonding. In this case, a dental implant (see Implants) would be more desirable because it does not involve reshaping the adjacent teeth. Second, because a bridge does not replace the missing roots, there is usually a small space under the pontics. Extra care is needed to clean underneath the pontics during your daily dental hygiene routine. Fortunately, there are dental hygiene products that makes this process easier. Third, because a dental bridge requires adjacent teeth to support the missing teeth, it requires sturdy and aligned adjacent teeth to share the load. Also, because the pontics (the units that replaces the missing teeth) has no direct support underneath and relies only on the adjacent teeth for support, a dental bridge has a length limitation. Despite some limitations, when dental bridge is chosen for a suitable scenario, it is a beautiful, predictable way to replace missing teeth. Perhaps a dental bridge is the right choice to treat your dental issue. Make a reservation for a consultation today (link). The following case of dental crown was published on ﻿June 2105﻿ on our website. 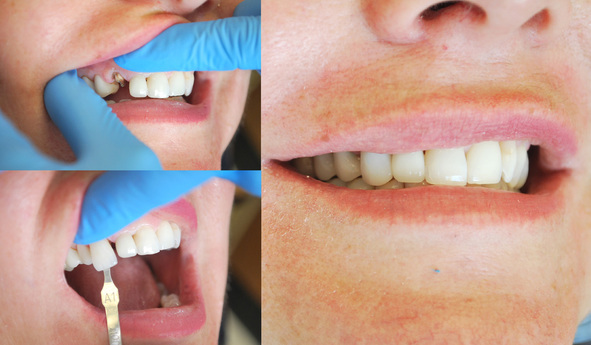 It is an example of using dental crown to replace a broken tooth (link).